Aspire Family Mediations Mediators are in Cambridge. Contact us today to arrange a call back for any enquire about mediation or to book an assessment! Our office in Cambridge is ideal for anyone living in St Neots, Huntingdon, St Ives, Sandy, Newmarket and Ely. We offer a professional, accredited mediation service. Our mediators are accredited by the FMA (Family Mediation Association). This body assures you that we have the qualifications and experience necessary to help you with your own mediation process. We are experienced in dealing with a variety of clients over the years. Our mediators provide a discrete and confidential service. We are flexible and aim to offer a variety of solutions to suit our clients. Even though mediation is an open ended process, we approach it with the conclusion is mind which is to enable you and your partner to agree to a mutually acceptable solution. Legal battles can be protracted and they can lead to much heartache in the long run. The legal process is necessarily adversarial. Legal teams fight in the interests of their clients to be sure that they will be on the willing side in a legal battle. Going to court, and giving evidence against your partner in some cases, can be very stressful. Even though you are getting divorced, legal battles can mean that your relationship deteriorates beyond all possibility of future communication. This can mean that members of the extended family, such as children and grandparents, can lose contact with one side of the family. As an alternative, mediation is a process that involves much less conflict. In mediation, the purpose is to bring parties together to produce a mutually agreed statement as to their financial and other affairs. This means that you will end the process able to move on with your individual lives, and in a much better position to talk to your partner. 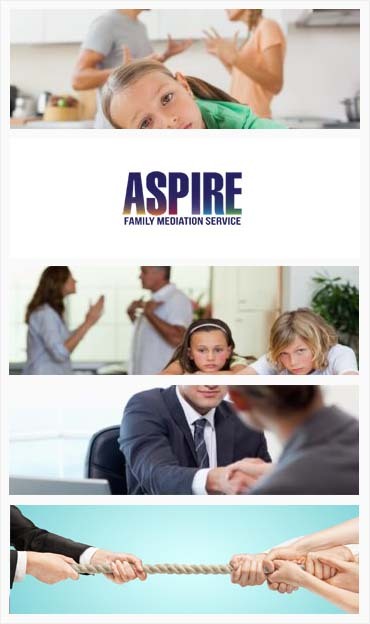 For the best services Aspire Family Mediation is just the perfect destination. All my disputes were solved quickly and I got what I always wanted. Aspire Family Mediation has the best mediators and I really mean it. My separation was not going to be easy but they helped me a lot in reaching a satisfactory agreement.